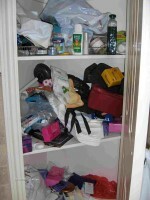 Mary's bathroom cupboard had become a junk hole - everything was just shoved in anyhow. All the item use-by dates were checked and then grouped according to category. The top shelf now contains first aid items and OTC pharmacy items. 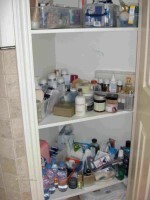 The second shelf holds cosmetics, whilst the bottom contains bathroom staples, such as soap.